Q1: Why become an online member? Participating in online contests that can win you great goodies. The best part of all - you get all of the above absolutely free, so get cracking, register now! Q2: How do I become an online member? Ans : If you haven't registered already - just click on the sign up Link on the home page. You will need to fill out a simple form and submit the same. You automatically get logged into the site as a member, once you key in your exclusive user name and password. 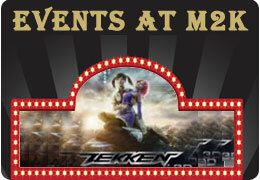 Q3: If I register with M2K Cinemas, will my details shared to other Companies? Ans : Your privacy is very important to us. All your information is kept confidential with us, at any time you are not happy with information write to us and we will surely tight the loose strings even though you want to discontinue the subscription, the option to un-subscribe is also given. Q1: How can I book my movie ticket online? Ans : After selecting your preferred movie, date & show at preferred location under Instant Booking on the home page of m2kcinemas.com, you’ll be redirected to select class of the seat and quantity of tickets after it click the button Proceed to Seat Selection, here you need to select your preferable seats as per direction given on the page, then click the button Proceed to Order Summary, it will show your selected movie details and total amount you have to pay. Please check it properly and then click on Proceed to Payment. At last you’ll be taken to the Payment Page, where you can enter your payment details. Once booking is done, you will get confirmation and booking IDs in your mobile and email. You can show the SMS or printed confirmation at Box Office and collect the ticket. Q2: Can I select my preferred seats in online booking? Ans : Yes, you can select the seats you preferred in online booking through www.m2kcinemas.com. For further assistance, please call at: 011-4816 4816. Q3: How do I know my booking is confirmed? Ans : After you pay for your tickets, you’ll be taken to the Confirmation page, where you can view your order summary. You’ll get a unique booking id, you can take the printout of the page. Further when you pay for tickets, you can enter your E-mail id and Mobile No., you’ll be confirmed about your bookings via E-mail and SMS as well. So, if you do not receive any confirmation, then there are chances that you might have entered wrong E-mail id or Mobile No. Your E-mail or Mobile inbox also might be full, because of which you are not getting your confirmation. Q4: How safe & Secure is buying tickets online on www.m2kcinemas.com? Ans : Our payment gateway is verified by Entrust, Visa and Master Card as well. There’s no threat to your private information provided online. Q5: If I am running late for the film will my seat be held or not? Ans : Once your purchase has been confirmed, the rights for the seats in the show is yours and would remain held till the show ends and your ticket will not be sold to another customer. Q6: Do I have to be a online member to book ticket online? Ans : No, registration is optional. You can also buy your tickets without being a member. Q1: Do I have to pay any extra fee for online booking? Ans : You have to pay a minimum convenience fee Rs.11.00 per ticket, to a maximum of Rs.28.00 per ticket depending on the ticket price. Q2: What methods of payment are accepted online? Ans : We have plenty of options for you to pay for your tickets. You can pay by Credit Card, Debit Card, Net Banking, and mobile. If you have any gift voucher, you can also enter your Gift Voucher number to pay for your tickets. Q1: Can I cancel the tickets that I have booked online and get a refund? Ans : Sorry, tickets once booked cannot be cancelled. No refund will be made if you do not turn up for the show. Q1: How and when do I collect my confirmed tickets? Ans : You have to present the Booking ID either by showing SMS received by you from bookmyshow or presenting printout of confirmation received on your E-mail ID, you can collect your ticket any time after the booking. Its recommended that you collect your tickets at least 15 minutes prior to show commencement to avoid last minute rush at Box Office. Q1: What happen if my computer/ Internet got stuck when I am in the middle of a booking? Ans : No worries. If you have made a successful transaction, you’ll get a confirmation via E-mail and SMS. In case you need any help during booking you may contact on 011-3989 5050. Q1: How can I contact M2K Cinemas? Ans : You can write us on info@m2kcinemas.com or call at 011-4816 4816. Q2: How do I find out a movie show time and its length? Ans : The movie show time and its length for most films will be displayed by clicking on preferred movie poster in the Now Showing section.